Guest Post: Amazon.com Creates 5,000 Jobs, Destroys 25,000 In The Process? The past few weeks have seen the tech and business media abuzz about a not-so-little warehouse in Tennessee. That's because this distribution center, opening its doors with a burst of fanfare and even a few visits from nearby politicians, isn't a jumping-off point for Macy's or Target. Instead, the warehouse is the latest in a series of new locations being opened by retail technology giant Amazon.com. The jobs this new mega-warehouse is purported to create: 5,000. The politicians who made the quick trip to Tennessee to get in front of the cameras included one President Barack Obama, who gave a rousing speech not just about the importance of the 5,000 jobs promised at this one facility (and another 2,000 corollary positions at customer service centers elsewhere in the country), but also about the "need" to raise taxes on the businesses that are creating them and use those taxes to fund "infrastructure" jobs in green energy and natural gas, among other areas. The politically charged speech and the press conference from Amazon.com touting its job-creation abilities have understandably drawn quite the skeptical reaction from some. But surprisingly, in all the talk I've heard in the media these past few days, most of the fury seems directed not at the proposed tax hikes, but at Amazon itself for creating what might be fewer jobs than it claims… and possibly for destroying more jobs than it creates. Along with its jobs announcement, Amazon's PR department was ready for the utterly predictable media criticism that the jobs are nothing more than menial, low-wage shop floor jobs. Its retort? These new jobs will pay on average 30% higher than typical retail jobs. That's a good thing for the employed, no doubt, to be paid more for a similar skill-level job. But with its emphasis on low prices, how can Amazon afford to boost those wages so much? It all boils down to efficiency. Think about Amazon versus another retailing giant without the same level of sales, but with a similar "low prices" kind of push: TJX companies (owners of TJ Maxx, Marshalls, and Home Goods). Last year, Amazon had retail sales of over $60 billion globally (up from $47 billion in 2011); TJX brought in about half that, at almost $26 billion globally (up from $23 billion in 2011). Whatever the companies' similarities, the differences between the two couldn't be bigger; and those differences have profound impacts for investors, as well as for the future of our economy. On one hand, you have companies like TJX—so-called "bricks and mortar" retailers—which in order to do business every day must staff a few thousand stores, and keep them open for 10, 12, or even 24 hours per day. That means greeters, checkers, security, customer service, and stockroom employees, plus bright lighting, catchy displays, and other ordinary features of a quality retail facility. Companies like Amazon have bricks and mortar too, of course, as displayed on the recent junket in Tennessee. But that's about all they have. Amazon can operate in facilities far off the beaten path, with nothing but wire shelves and cement floors, and they can serve just as many customers from only a fraction of the locations—and a fraction of the manpower—that their competitors require. On just about every front, the company is more efficient than its peers. But let's look specifically at two of the top expenses for virtually any retail company: its plant and its people. Last year, TJX ended with 3,055 stores, making it one of the most prolific clothing and home goods retailers in the US. It pegs its sales at a respectable $8.5 million annually per store. That's not a big-box retailer like Best Buy, which racked up $25 million per store in 2011, but it's solid compared to many other clothing and home goods retailers (like Sears, with much larger stores and only $9.5 million in per location sales, or the Gap, with smaller, mall-style stores and only $5 million per outlet). Of course, it's unfair to count only fulfillment centers, as the company handles customer service at separate locations, something a retailer like TJX would normally handle mostly onsite in the stores (excepting the separate online sales division, but that constitutes only a small fraction of TJX's business). Add in those locations, plus the newest centers Amazon plans to open, and you still have fewer than 100 retail operations centers globally. If we round up just to be fair, that pegs Amazon's sales per location for the past year at $660 million, or about 80 times the sales per location of a TJX. In addition to the amount of dollars per square foot in revenue that Amazon can push out its doors, the company can strike deals to grab land in otherwise desolate areas for its facilities, so long as UPS and FedEx will service them—no need for high-rent districts with lots of shopper traffic. This means that not only does the company have to support fewer square feet of space and make each square foot less glamorous, it can also push into districts willing to offer it big tax savings, or where construction costs are highly depressed (often one and the same). Amazon's negotiation power and economies of scale are both significantly higher than the average multi-thousand storefront retailer. Of course, having more sales per location means less if you have to fill that location with just as many people to get the goods out the door. Sure, you save on the overhead from electricity to property taxes, but you can only gain so much efficiency in a labor-intensive business. But here too, Amazon's differences are broadly apparent. TJX Companies Inc. has approximately 179,000 employees: as with any retailer, it's a mix of full-time, part-time, and seasonal workers. Amazon's demand is just as cyclical as any other retailer. When queried at the press conference in Tennessee, a company rep wouldn't specify how many of the 5,000 promised new jobs are part-time and seasonal. He instead jumped back to the pre-approved talking point about pay being 30% higher on average. The spokesman did acknowledge that a good number of them would not be full-time, year-round positions. In all, though, Amazon has managed to grow to its current level with just about 89,000 employees, or almost exactly half of TJX’s workforce. To do that yet pull down 150% more revenue makes Amazon about five times more efficient than TJX, measured by retail sales per staffer. Amazon is able to do so because the number of shoppers who can be served per warehouse employee is much higher than at a typical retail location—especially the smaller stores that TJX mostly uses. The same goes for all the servers the company operates: one IT guy can take the midnight shift and keep a few thousand servers up and running, but one janitor cannot clean the floors at two locations, let alone 400—and many other aspects of the business share this limitation. As is obvious above, Amazon's revenue per employee is leaps and bounds above its competition. The only other one on our short list that comes close is CVS, but despite the public perception of the company as a retailer, it now generates the overwhelming majority of its revenues from its insurance programs, so it's partially miscategorized. Even so, it still doesn't come close to Amazon in terms of revenue efficiency; CVS would need to grow its sales by greater than 50% without adding a single staffer in order to catch up. Walmart? It would have to lay off over two-thirds of its employees or triple its same-store sales to even come close. 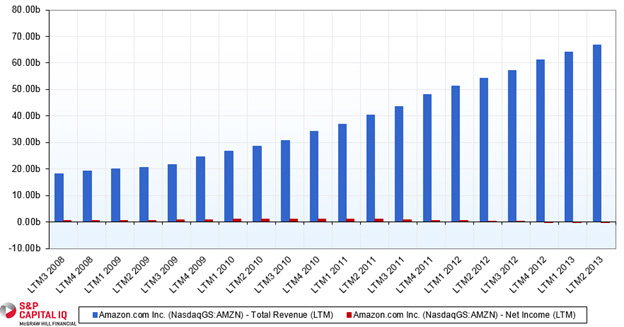 Amazon's revenue efficiency is remarkable by virtually any standard. And it's one of the reasons that despite a long track record of underperforming on earnings, the company has generally stayed in the market's good graces and been granted a hefty valuation relative to its peers. The market sees Amazon for what it is—a technology company with leverage that can grow revenues in a big way—and not a more traditional retailer. But this also means that for every jar of Crazy Aaron's Thinking Putty that is shipped out the door, the number of people on the payroll is only one-fourth that of Walmart or Target… or one-fifth that of TJX. What Does This Mean for the President's Jobs Plan? Does this mean that Barack Obama is right? Does the government need to step in, tax these efficient companies harder, and spend that money on solar farms, wind turbines, and transport infrastructure? After all, you cannot efficiently deliver tens of millions of packages when roads are choked and bridges are crumbling. At first glance, it would be easy to jump to that conclusion. That's the direction I heard quite a few of Tuesday and Wednesday's commentators heading with their questions, even on business-oriented stations like my morning commute companion, Bloomberg Radio. And yes, in some senses, for every job Amazon "creates," four other jobs go away at a company like TJX. But it's not that simple. First, with any efficiency comes inefficiency on another point. The relative competitiveness of two business models is driven by the economic weight of those items in contrast to each other—an equation that changes over time. For instance, Clayton Christensen eloquently pointed out years ago in his book The Innovator's Dilemma (available at Amazon.com, of course) that at one point the commonplace hydraulic backhoes and diggers that litter every construction site in the modern world were once considered vastly inferior to their cable-actuated big brothers. Per foot, they couldn't—and still can't—dig nearly as wide a moat per pass. But it didn't matter. They won the overall market on convenient smaller sizes, easier maintenance, and better safety. Their inefficiencies were simply smaller than the value of their improvements. Much the same, while you can argue about Amazon's relative efficiency to TJX, you must be careful not to discount its INefficiency. For instance, at a store like TJMaxx, one truckload of goods can restock the place for weeks. To deliver the orders of a few dozen Amazon customers might require dozens of individual packages, shipped to half a dozen different sort facilities, and put on a few dozen different trucks. TJX benefits from all the dinosaur dung burned by its customers coming to the store and driving goods back home for it. Amazon, on the other hand, takes those nearly countless millions of extra miles and absorbs them into its business model. 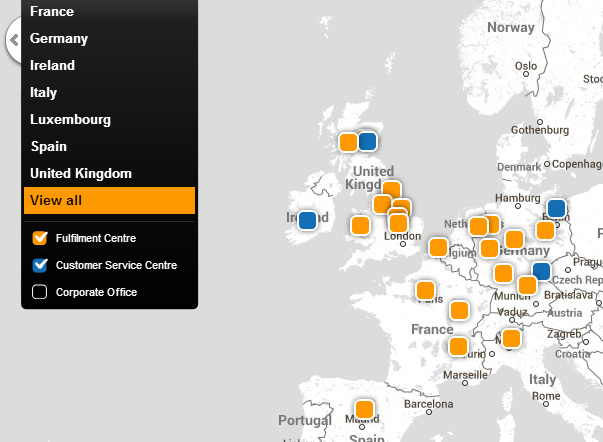 Compared in this way, Amazon is incredibly inefficient. What Amazon doesn't spend hiring direct employees, the company outsources to others, and the sum of those expenses is enormous. You might have to squint to find the red bars that represent profits. The difference between those two sets of colored bars is the amount Amazon spends on not just its 89,000 employees, but all of its operations and marketing. All of those dollars flow into the economy, be it through FedEx drivers and pilots, outsourced programmers, content licensing agreements, purchases of inventory to keep its unimaginable selection of goods growing, or any of hundreds of other paths. And each path is itself a series of jobs generated and a series of taxes that eventually do flow to the government to fund all of its activities—from building fences to keep out Mexicans to staffing the IRS to collect all that money. Even if the company was profitable, the same would be true. Those people who made more money would be inclined to invest and spend it. The higher the relative profitability, the more free cash flow, and the more likely it is to turn into additional spending. Any company whose technology improves efficiency in these ways is going to reduce employment in the affected industry. That's the breaks. But it does not necessarily mean those jobs are gone forever. A time will come when the amount of efficiency gained by automation, aggregation, logistics, and other techniques puts another significant and serious dent in the demand for labor—we've already seen it with low-skill manufacturing jobs, and we are seeing it take hold now in retail sales. But that does not have to mean the end of the economy or an economy of no jobs. Instead, the efficiency flows outward to create new opportunities surrounding the new business and its investors. Revenue efficiency creates demand for business services. What is not done in house gets pushed to other networks of suppliers—services contracted by the sellers or by the buyers. Also, profit efficiency creates income for investors, which gets reinvested into more new businesses. Just look to the Silicon Valley venture-capital scene, and you'll see years of investment gains flowing back into the markets to the tune of multiple billions of dollars per year in investments into companies bent on reinventing every area of the economy, from entertainment to building supplies to biotechnology to car rental, through technology. The biggest risk to our economy and employment is not innovation, which speeds up the flow of capital. Rather, the risks to be on the lookout for are the ones that compromise the ability of businesses to innovate, or which otherwise impede the flow of capital—i.e., those that restrict lending, cause people or companies to hoard cash, or generate fear and distrust among trading partners. Fears over banking failures in 2008 showed just how serious this risk can be. And while the short-term reaction of shoring up liquidity in financial markets may look to have been a smart one in retrospect, the long-term lack of consequences for outright criminal activity in that sector are damning for the future of the economy. Trust in our government, bankers, and currency continues to be at all-time lows, a factor that can only be slowing the return of economic growth. If Barack Obama and camp want to generate more government revenues, they should consider backing off on the new taxes and focus instead on limiting the regulations that impede the flow of capital. They should help secure confidence in the economy, not just through buoying up the stock markets, but through justice and prudent oversight over the value of our money and security of our savings. Companies like Amazon thankfully continue to invest and grow despite the rising tide of operational regulations (for all the deregulation in banking over the past 20 years, the same cannot be said of any other sector) and the continued political immunity of the banking class. As it does so, its innovations are making life better for the majority of people. While the industry-wide shift of employment will be painful to some, over time the economy will adjust, as it always has, and other employment opportunities will fill the gaps created. Plus, it's not like Amazon has a lock on retail efficiency. After all, Costco—the star quarterback of the big-box store movement—generates over $975,000 in sales per employee. Yes, it seems like even Amazon could still learn a few things. As for the question of whether more efficient companies—which employ software and even robots (as Amazon does in its warehouses increasingly every year) to save on labor—destroy more jobs than they create… it's not as simple as it might seem at first. Innovation ultimately benefits society, so we must be careful not to hamper it for fear of the unknown future it will bring. While technology jobs pose a conundrum for politicians, companies like Amazon will continue to grow their market share and make handsome profits for investors. If you aren't making your share of them, consider a risk-free trial subscription to BIG TECH today, and see the actionable and profitable investment advice our technology team provides for yourself. Learn more and get started today.